bpm'online Review: "Personalizing Marketing Campaigns"
bpm’online has been critical in CMcadeiras’s digital transformation. Thanks to the automation of marketing and sales processes, it is now taking us hours what used to take days and this is crucial for productivity levels. From a marketing standpoint, the ability to deeply personalized omnichannel communications to strategically target various types of customers, from private to retail, has been a dream. bpm’online encloses a database of customers and their purchasing decisions, making the job of the marketing department truly effortless. bpm'online Review: "A great way to organize company processes"
Bpm’online has assisted our company in organizing our accounting processes. In many cases processes were being practiced, however, nothing was documented. Alternatively, processes were documented but not being practiced. Now, all processes are organized. Each user’s activity is identified and each user held accountable. With this complete oversight, human error is easily identified and corrected and processes easily adjusted to minimize mistakes. A generous selection of Accounting Connectors, Add-ons and Software Solutions. We have not had to go outside of the bpm’online software in search of such applications. The time needed to sift through our company processes. It was an intensive, organization project to undertake before we could even think about implementation. bpm'online Review: "Great product for the price with powerful bpm tools"
It really helped us to increase conversions. With proper integrations, we were able to reduce basket abandonment and configure the right business processes for working with drop-offs. It is currently used by marketing and sales teams. bpm'online Review: "Reinforcing сompany processes"
Bpm'online has provided us the flexible platform needed to further design and automate processes, helping manage more efficiently administrative tasks, such as expense report filing. Bpm'online is such an easy product to use. Most employees at the company were enthusiastic to change (I know, believe me, it was surprising) to a platform where, with a few clicks, an order can be paid, filed and tracked for future reference. This has made internal and external auditing simpler and less stressful and time-consuming. Our sales department also utilizes the system for sales-related operations, which is beneficial as we have the same information in one place. The training and help provided through the transition was truly outstanding. Bpm’online did not hesitate to go above and beyond to answer questions and make the transition to the new software seamless. Customer Service is great, the product is great, and add-on connectors and applications are available. There is nothing else to report. The product is truly versatile, I highly recommend it. bpm'online Review: "Awesome marketing and reporting abilities"
The entire marketing team benefits immensely from a unified interface for lead management and lead generation, as well as campaign design. All retrieved information is then analyzed in the system with dashboards, ensuring everyone in the department is on the same page. Having the ability to check lead profile accuracy and search the system for duplicate leads is a huge plus. 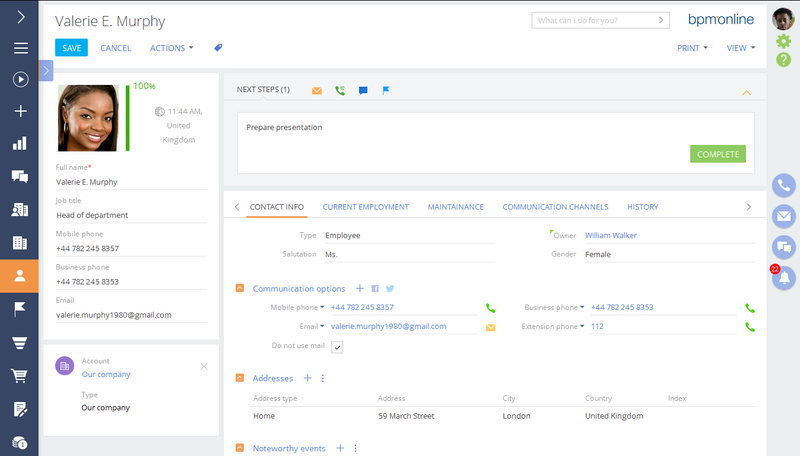 Another great feature is having the ability to connect leads to relevant accounts to enrich lead data. 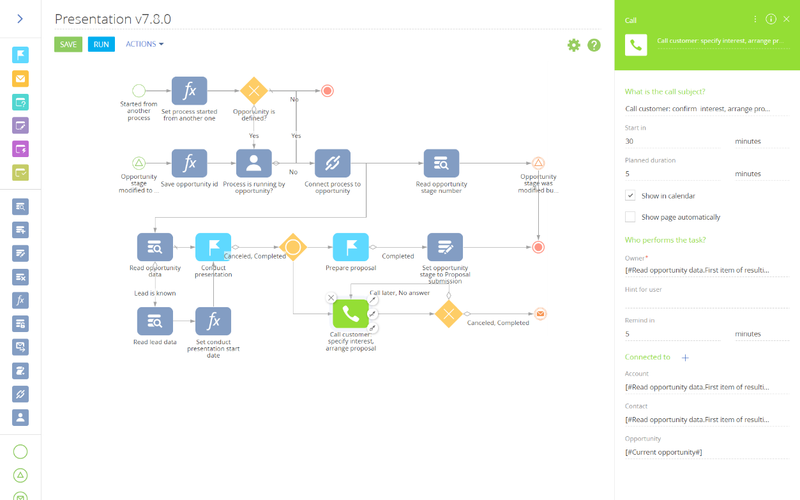 Tools for reporting are awesome: we were able to integrate bpm online with other tracking solutions so it drastically helps us to identify traffic sources, channels and link this data to leads or accounts. Offer more design features in the marketing campaigns. It is good for data segmentation, functionality integration, to get a better understanding of customer behavior, reporting for SEO and other digital marketing purposes. 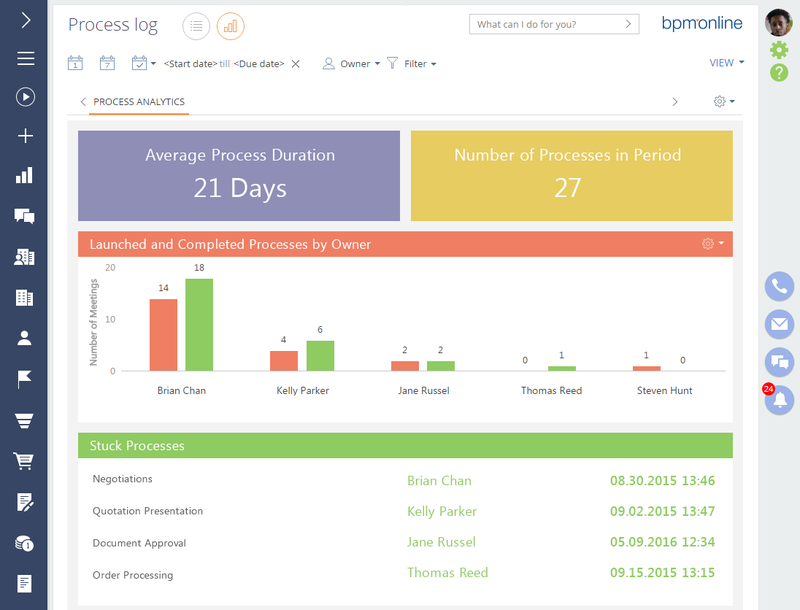 bpm'online is being used throughout our entire organization (5 people). For us, prior to bpm'online we had no organized, sytematic way of keeping track of our community members, or any other information. We had a contact management system that was recommended to us, but it was not well-suited to our needs. Customer service is stellar. Especially our current support specialist, Daniel. He is quick to respond, willing to help, and always accomplishes what he says he will. The UI is very aesthetically pleasing, and overall very intuitive. The customizeabilty of the system is undeniable. They are continually taking suggestions and working to make improvements. Each release has new features that are interesting to us. The marketing platform is not very user friendly in our experience, coming from a system like MailChimp that has a lot of freedom and very few limitations on what you can send and how it was sent. The marketing platform seems to have a lot of stipulations around size requirements of photos, text, etc. We've actually stopped using the marketing side all together, which is disappointing for us, because having a marketing platform attached to your contact management system is great for data and integration, but we found that the time spent and the quality of outreach we were able to create just wasn't worth it. Very customizeable. I might suggest that you have a developer on staff to help with set up. This would have made things much easier. Bpm’online CRM is an agile CRM platform that aims to help midsize and large enterprises accelerate sales, marketing, service and operations. Bpm’online provides its customers with comprehensive full-fledge applications for marketing, sales and service management that can be deployed as standalone products, or as a bundle on a single CRM platform. Bpm’online sales: sales automation software to accelerate the complete sales cycle — from lead to repeat sales. Bpm’online marketing: multichannel marketing platform to orchestrate customer journeys and accelerate lead-to-revenue. Bpm’online service: intelligent service management platform to accelerate service delivery and customer delight. • Accelerate implementation using out-of-the-box capabilities. Bpm’online delivers out-of-the-box solutions, integrations, and best practice processes for marketing, sales, and customer service that accelerate implementation and integration. • Accelerate adoption with intelligence and user-friendly UX. Bpm’online combines AI with leading UX to accelerate user adoption. • Accelerate change with agile low-code platform. Bpm’online is as a powerful low-code platform to accelerate ongoing transformation. • Accelerate alignment with cross-functional orchestration. Bpm’online enables processes to interact across applications from front-office to back-office, automating the manual processes to accelerate organizational alignment. Has featureThe BPM platform - merger of CRM with BPM helps users design and automate processes to deliver improved customer experience. 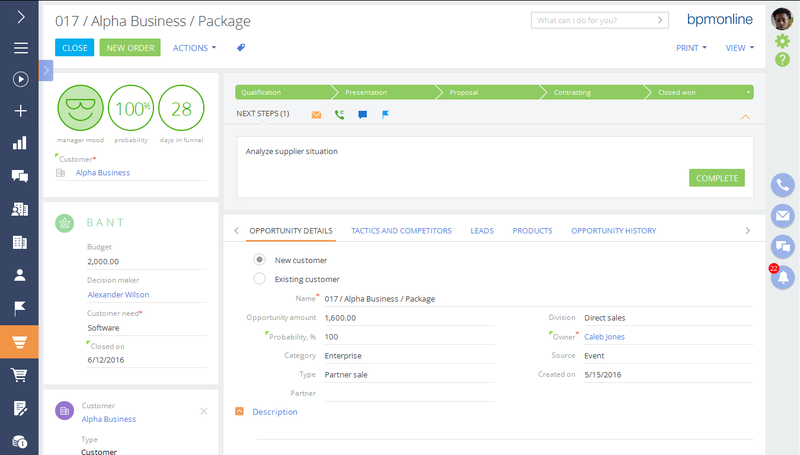 Has featureComprehensive full-fledge applications for marketing, sales and service management on one platform that can be deployed as standalone products, or as a CRM bundle. Has featureSpecial application for field sales which enables field sales reps to use their mobile devices to obtain access to the customer database, calendar, product catalog and knowledge base, orders and contracts.